We discuss all sorts of time-honored puzzles and brain teasers here on the blog, but it’s not often that those discussions wander into the arena known as bar bets. Simply put, bar bets are contests between two parties wherein money or free drinks are wagered on one’s ability to accomplish a given task. Sometimes, that task is answering a bit of trivia, or engaging in a feat of strength. But more often than not, bar bets are brain teasers designed to separate a fool from his money. And if you approach them like brain teasers, you have a better chance of holding onto your hard-earned dough. You see, many of these bar bets are designed more like carnival games than fair wagers; there’s usually a trick involved, and your opponent is wagering on you playing by the rules, rather than out-thinking the game itself. Example: the wager seems simple. There is a drink placed completely beneath a hat. You must drink the drink without touching the hat. It seems impossible, but that’s where you must get creative. You can crouch down near the hat and make a slurping noise, and then declare that you’ve succeeded in drinking the drink. Your curious opponent is forced to lift the hat to check, and at that moment, grab the drink, down it, and you’ve won. You adhered to the letter of the wager, but not the spirit. But that’s the name of the game. Be careful, because some bar bets are based solely on wordplay. Example: Tell your opponent to get a coin out of their pocket and set it under a drink coaster, ensuring that you don’t see it. The wager? That you’ll be able to tell them the date. As you wave your hand over the coaster, as if doing a magic trick, simply announce today’s date. After all, you weren’t specific. You just said you’d tell them the date, not necessarily the date on the coin. A similar one involves wagering that you can stay underwater for any particular length of time. Once you make the wager, simply hold a glass of water over your head for that amount of time. A little cheap? Sure. But hey, a bar bet is a bet. And the devil is in the details. Some bar bets, though, come down to technique. 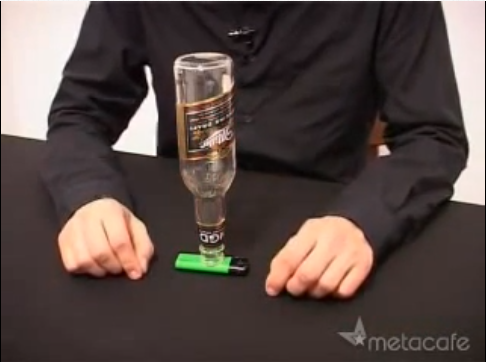 You present a seemingly impossible task, and then accomplish it in a clever way. For example, my favorite bar bet: You have a glass (a wine glass, a shot glass, whatever), with a coaster (or business card) on top of it. Atop the coaster is a cigarette, standing on end. And atop the cigarette is a coin. The wager? 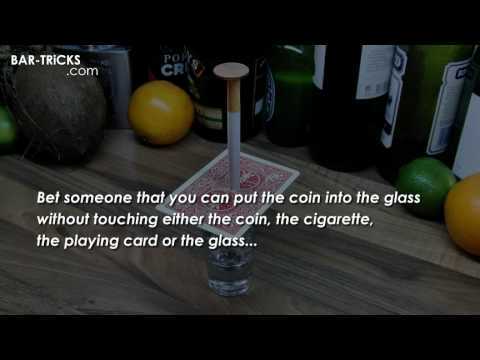 Put the coin into the glass without touching the glass, coaster, cigarette, or coin. There’s no wordplay, no trickery, and no deceit here. This one is all about gravity. You see, the coaster and the cigarette are light, while the coin is not. If you crouch down below the glass and blow upward, you’ll be able to push aside the coaster and cigarette, leaving the coin to fall straight down into the now-open glass. Easy. Once you know how it’s done, that is. What’s your favorite puzzly wager, fellow puzzlers and PuzzleNationers? Do you have a favorite bar bet, trick, or crafty challenge up your sleeve that leaves others befuddled? Let us know in the comments below! We’d love to hear from you.